What can I say? There’s nothing I love more than fresh inspiration and big ideas and sometimes I go a little crazy with my pinning and planning. Thankfully, his practicality usually keeps me somewhat grounded. Ahem. On the flip side, he’s pretty darn talented when it comes to building and creating, and I feel quite spoiled in how he’s been able to bring many of my more realistic Pinterest dreams to fruition. Take those gorgeous laundry room tub sinks, for example. They’re all over Pinterest, and in my house dreaming, I was bound and determined there would be one in my remodeled laundry room. It took us a while to figure out the layout and logistics, and I’m pretty sure our plumber thought we were weird, but it was totally worth it. I had an extremely hard time finding laundry tubs on a stand that were meant to be used as a sink. Many of the reproductions out there are for decorative purposes only, or are meant to be planters– they are not watertight. The legitimate antiques I found were too fragile for regular use and they leaked. I needed a single tub (due to the space in our laundry room), not a double. The only place I could find selling single, watertight reproduction tubs was completely sold out. So I had to readjust my sails and come up with a different plan. I scoured our local antique stores for an old tub, but struck out repeatedly, as anything I found was either the wrong size or had rusty holes in the bottom. So we finally settled on a $24 galvanized tub from our local farm store. Not necessarily my first choice, but now that it’s in, it’s perfect. The galvanized tub we chose is 22″ in diameter and I don’t have to worry about leaks since it’s new. We also chose to set it on top of the counter, instead of setting it inside. I love the exposed look and wanted people to be able to see the whole tub. We drilled a hole in the middle of the bottom of the tub, purchased a drain for it, and opted for chrome pipe underneath, instead of PVC, since the plumbing is exposed. Would I have this as my main sink? Probably not. Because it’s not designed to be a sink, the bottom doesn’t taper, so it doesn’t drain perfectly. However, it’s perfect for washing veggies from the garden, milk jars, or fresh eggs. And it’s so preeeetttty. Instead, Prairie Husband built a custom stand with some leftover rough cut cedar we had hanging around. For the counter tops on the washer/dryer cubbies and the counter top under the sink, we lined 3/4″ sheets of plywood with copper sheeting. 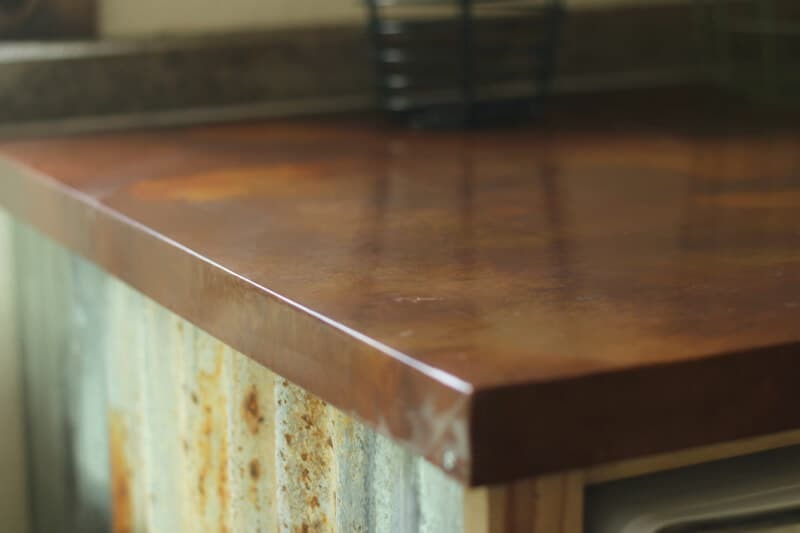 I adore copper, but I wasn’t brave enough to put in on my kitchen countertops (I’m too rough on stuff when I cook…). Therefore, putting it in the laundry room was a nice compromise. I definitely wanted a vintage-y faucet to match the feel of the rest of the room, so I splurged on this vintage-look faucet from Amazon. 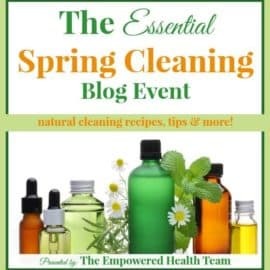 The sprayer was especially important to me, as I wanted to have flexibility if I was washing something awkward (like a small dog…) or needed to rinse out the bottom of the tub after washing a bunch of muddy carrots, or something like that. The laundry room might be utilitarian, but I still wanted it to be pretty in a rustic sort of way. I don’t really care for knick-knacks and prefer that my “decor” be functional items stored in beautiful ways. The open shelving we chose works perfectly for that. 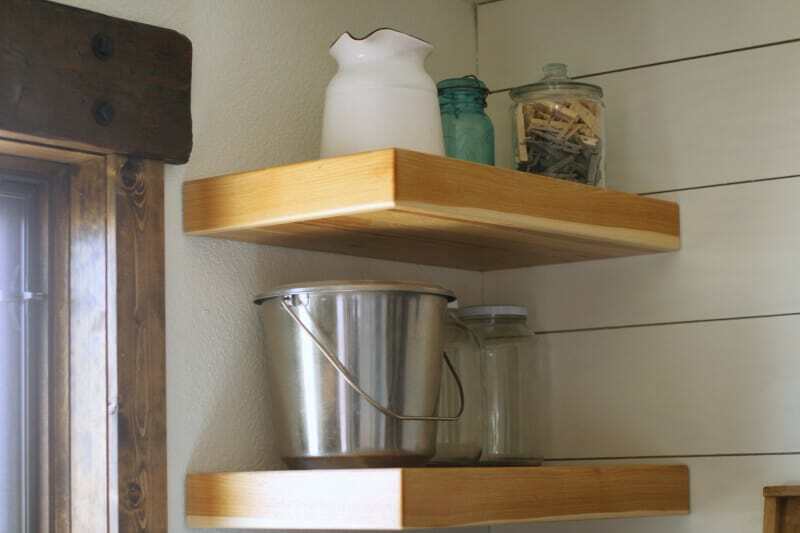 I am SO HAPPY I finally have a dedicated spot for my milk bucket and jars. 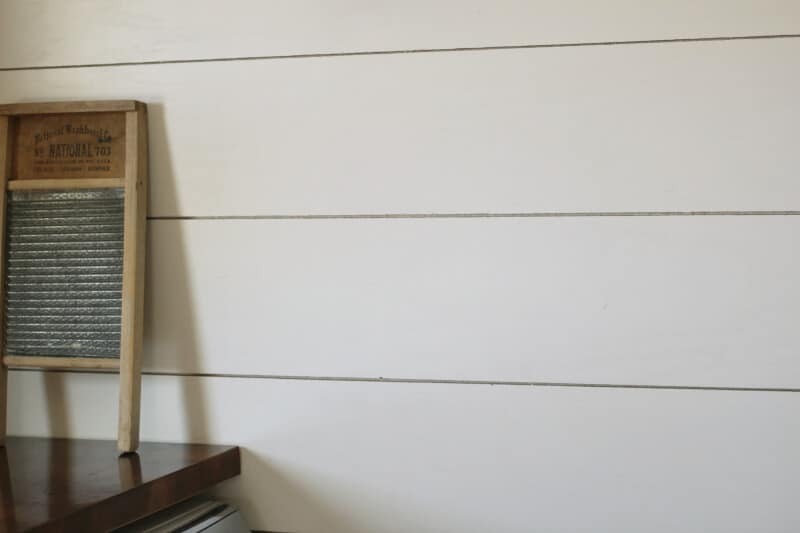 The white plank shiplap (custom built by the Prairie Husband, of course) and salvaged corrugated steel panels add to the rustic feel of the room. This is an old headboard I nabbed at a garage sale for $1. I dressed it up with a bit of chippy white paint, galvanized steel panels, and vintage knobs to give it a second life as a message center. 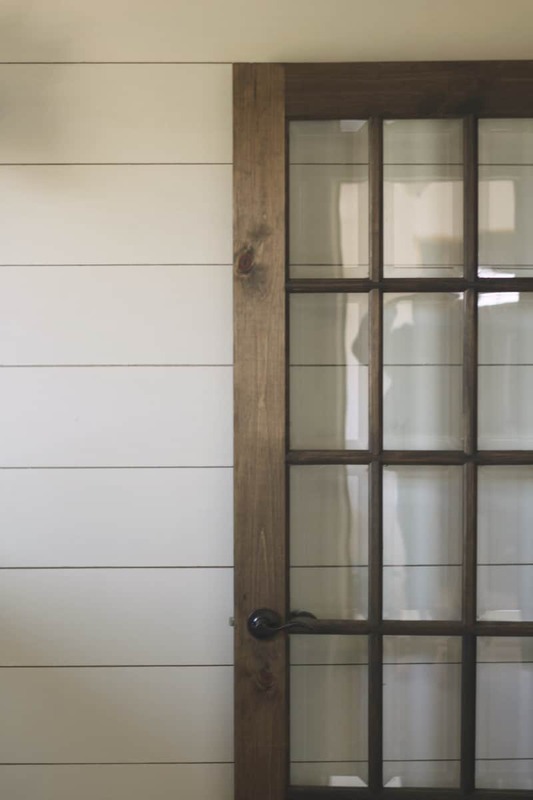 We ordered this elegantly simple 15-pane window door from our local building store and stained it to match the doors and trim in the rest of the house (stain is Jacobean by Minwax). This room will take a lot of abuse from muddy Prairie Children, so we went with wood-look tile instead of real hardwood. 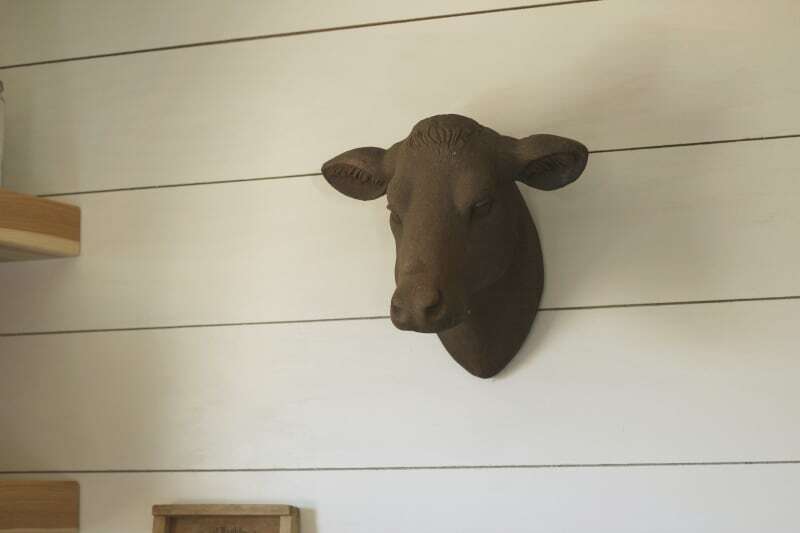 I found this crazy cow head on DecorSteals.com and it instantly caught my eye. It’s kinda quirky and off-beat, which is exactly why I love it. I think I might put some greenery around it, or maybe an old chipped-paint frame. I named her Wilma. All in all, I’m head-over-heels in love with this room. Believe it or not, it actually used to be our dining room– complete with no windows, a very short, uneven ceiling, and barely enough room to have 4 people sit around the table. It’s a much better laundry room, I think. I still hate doing laundry, but at least I have Wilma to keep me company while I’m in there. The rest of our house tour will be coming soon– stay tuned! I love this laundry room. Very functional and rustic at the same time. I could see myself talking to Wilma–of course when no one else is around. Sooooo stinking cute!!! Love it! Miss Wilma needs a hat! Or a lovely halo of silk wildflowers! That is seriously cool. My laundry room is shoved into the far corner of the porch that is full of everything you could possibly need in a small porch……some day I will have a very cool, functional laundry room. Someday. AWE, I love every bit. especially Wilma!! Really nice work, but I do agree with weird. I love the corrugated steel. We are planning to put some by our wood stove. And I want to put in a water trough for a bath tub. You are totally my style, can’t wait to see what else you do in your remodeling. I can’t wait to show y’all the rest of the house! Did you do anything to the courrigated steel to seal it? In case it gets water on it or just to be able to wipe it down. 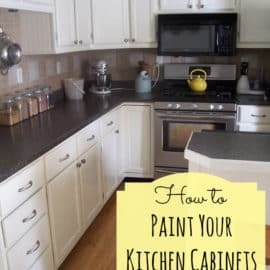 I planning on doing some in my kitchen . Thanks for sharing. I have one of these in my remodeled bathroom and it does need sealed. I don’t know that I’d do this as a kitchen sink. It’s fine as the guest bathroom or this laundry room sink but a kitchen one…. don’t do it. Anyway, I just used clear bathroom caulk smeared about to seal the bottom of mine and taper it a bit. Worked. I LOVE your laundry room. I’m so excited I scored an antique enamel laundry sink with legs. It’s sitting in our laundry room now just waiting to be plumbed in. Your sink is a great sink too! I especially love the corrugated siding too!! Oh, how fun! What a great find! This is so adorable! I love Pinterest too. I’m actually kind of obsessed about it. This is very cool – But I want to also say I love the trim around the windows and the detail with the hardware is fantastic. You must be very excited to see all this come together, Thanks for sharing! You’re going big with your home which makes sense and now that we’re empty nesters we’re getting ready to go smaller. I would say fun times for both. Enjoyed! Thanks Carole! I can totally see the appeal to downsizing– less to clean and maintain! Love it! We need a “before” picture of your old laundry space. And a full view picture of the entire new room. 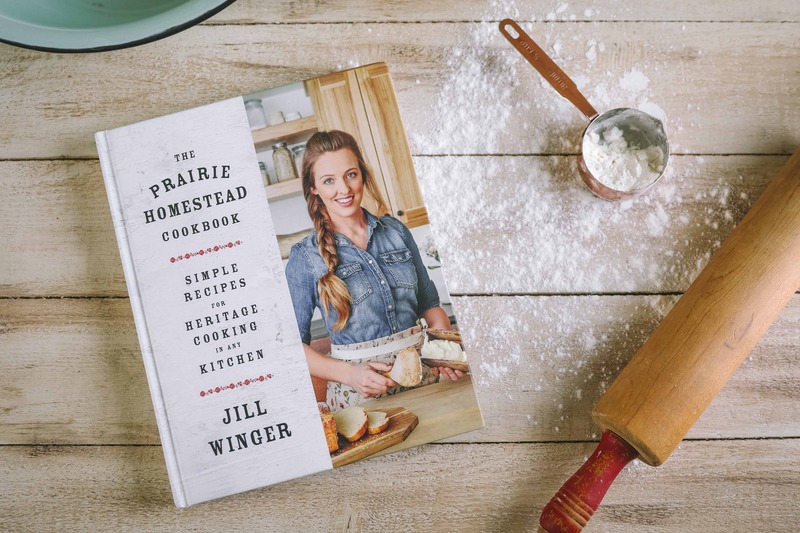 You know us wanna-be homesteaders are living vicariously through you. ? where – oh – where did you find the wood look tile??? that is exactly what i need to finish my new addition. We got this stuff at Lowes! Beautiful! We are homesteading in South Africa. Bought some land last year and took the leap of faith into homesteading:-) will be checking out your ideas! I LOVE the pinterest inspiration look! My husband AND son will give me the same look when I tell them what I have seen and would like done. Oh, and Wilma, well, she is fantastic! Beautiful room. 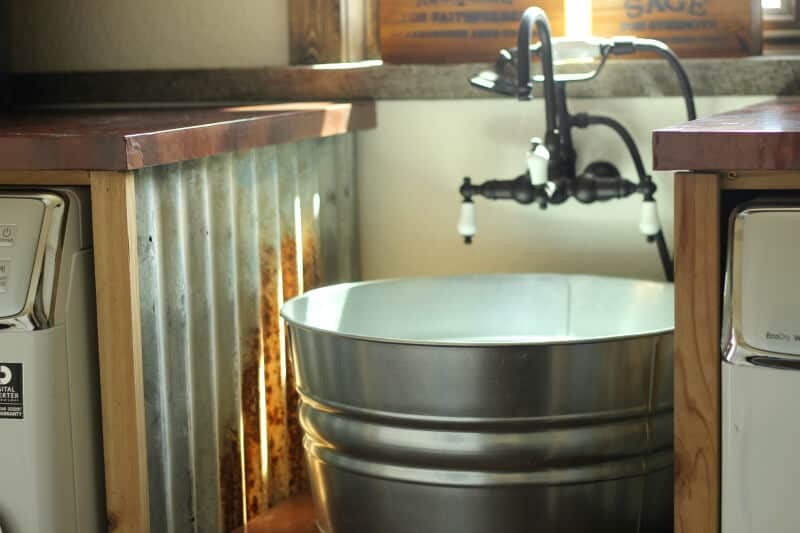 Love, love, love the washtub sink. 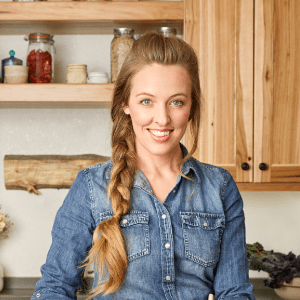 That corrugated tin is so farmhouse delicious. And those tile floors are going to be so practical. Your laundry room is wonderful! Can’t wait for the full tour. I’ve got to say I admire you for taking on the extra with a new baby. Awesome! Thanks Peggy. 🙂 There have been times I’ve questioned my sanity, but it’s worth it now that it’s almost done! I think Wilma needs a cowbell! You are right– she does! 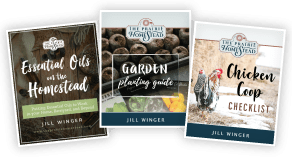 I am constantly showing my handy hubby Pinterest ideas! Lol! We just renovated a secondhand chicken coop and there were many times I’d haul out my phone while standing in the coop with him to show him something I pinned and wanted. He did a great job! I love your laundry room. Got to love those handy husbands! 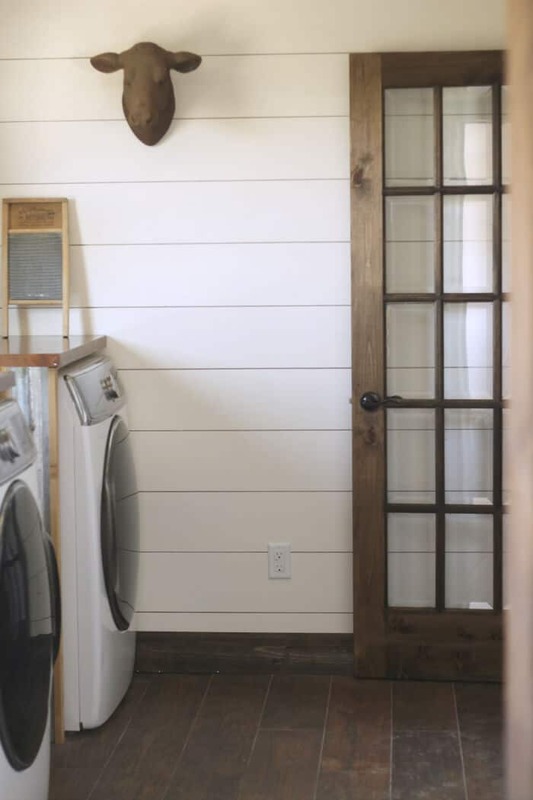 Oh my….I do love your laundry/mud room. I love all things rustic. Yes, Wilma needs a cowbell with her name on it and a little straw hat with daisies. I really like her and may have to hunt her down. Love, love your new room. A pleasure to do laundry there. Love the cow head and thanks for naming her after me! I agree that a hat would be fun. You could change it for the seasons. You are my hero. A seasonal hat! 🙂 I love it! Perfect for the “tiny home”! I may have missed this, but how did you secure the tub on the counter top so it doesn’t ever move? Love your laundry room! We planned a half bath around setting a galvanized pail from Lowe’s on an old vanity – now that we’re at installation point, our plumber says it can’t be done. 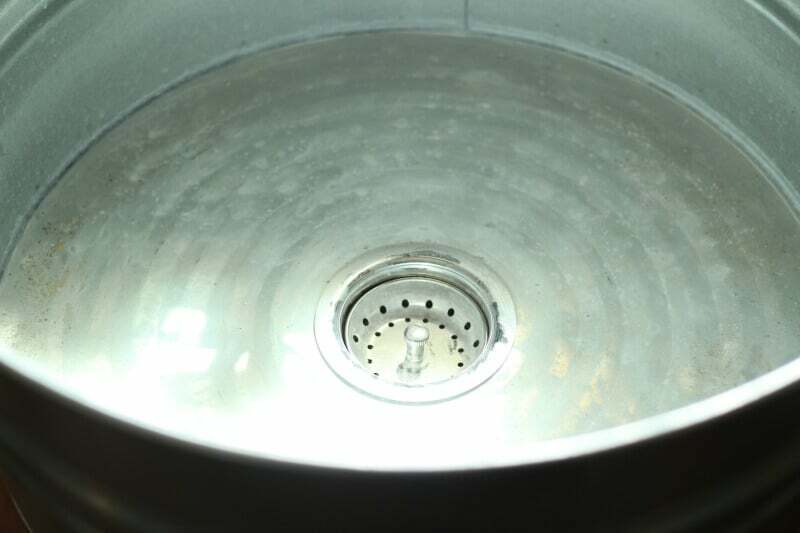 It’s leaking where the drain goes out through the bottom of the pail – he suggested pail bottoms are too thin to hold drain attachments securely. I hoped silicone could solve this – do you have any suggestions? Thanks! Hmmm… We did use silicone around the bottom of ours. I imagine it depends on the bucket, though? I never would have thought to “design” my laundry room. Other than specific needs like shelving, it truly just never crossed my mind. Great job! Inspiring as well, thank you for sharing! I had the same crazy idea and now have a livestock trough with I drain in it. 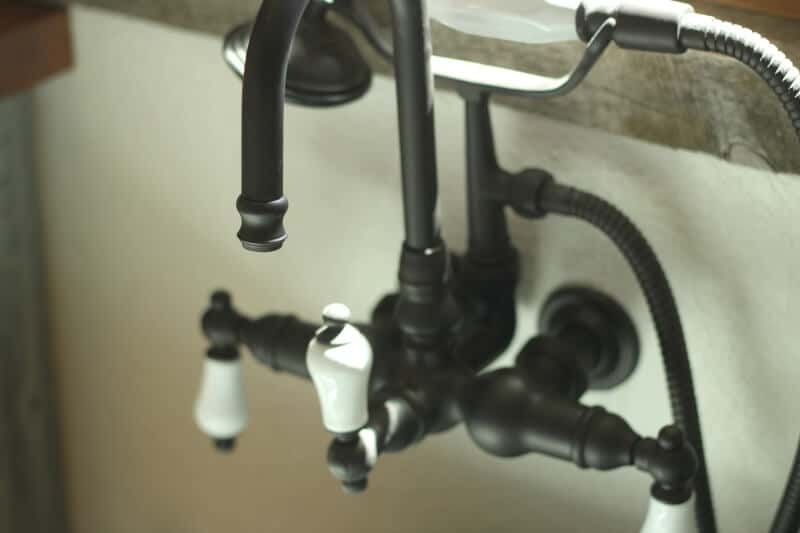 How did you attach your “sink” to the countertop? Ours is a 2x4x1 livestock trough so just the plumbing fitting isn’t enough to secure it. I’d love to hear what you did and if it worked for you. We siliconed it around the base. We are building and doing this type of sink in our laundry room as well. 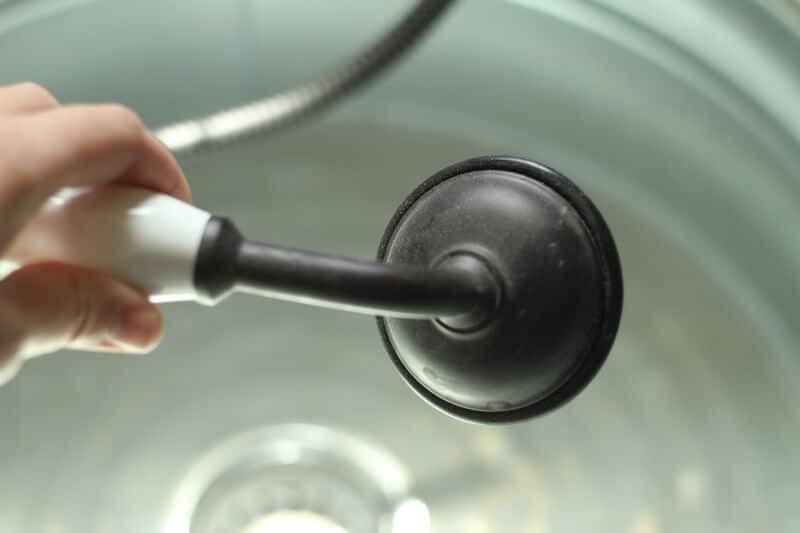 Have you had any issues with yours leaking or getting mildewed? I am wanting to do this type of a sink in my kitchen, but can’t find any information on if I should put some seal or coating on the bucket. Any ideas? We didn’t use any coating on ours– although we aren’t using it daily, either. Hi!! 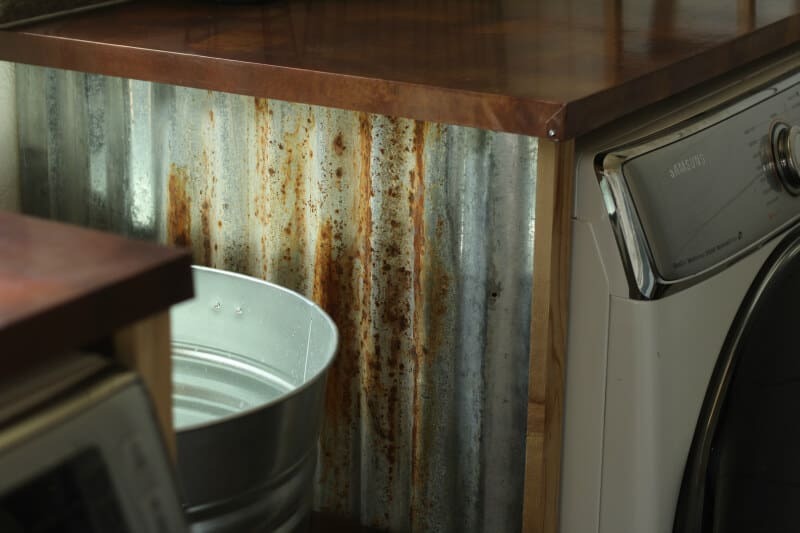 We are wanting to use galvanized sinks in our kitchen also. Have you installed yours yet? How are they working? Did you seal them? I have picked out the double galvanized on a stand that already has the drain pipe in place. Please let me know how your’s are working. I have this info my kitchen, although mine is bigger and oval shaped. I did not put any sealant on it and wish I had. The bottom on the inside has turned black. I don’t mind the rustic look, especially since I basically only use it to catch dirty dishes, but it will never look shiny and clean again. I have no idea what you could use to seal it that won’t come off and that is food safe. Maybe some sort of epoxy? I did use a thicker, pour-on clear epoxy for the wooden base that the tub is attached to. Similar to a finish you would see in a restaurant bar. I have not regretted it. I’m constantly wiping it down, and it still looks brand new. I’ve had this setup for 4 years. I want to put one of these sinks in my laundry room in the house we are building. Do you know if it will pass inspection if it does not have a drain hole? So funny that I commented the first time you posted this!! 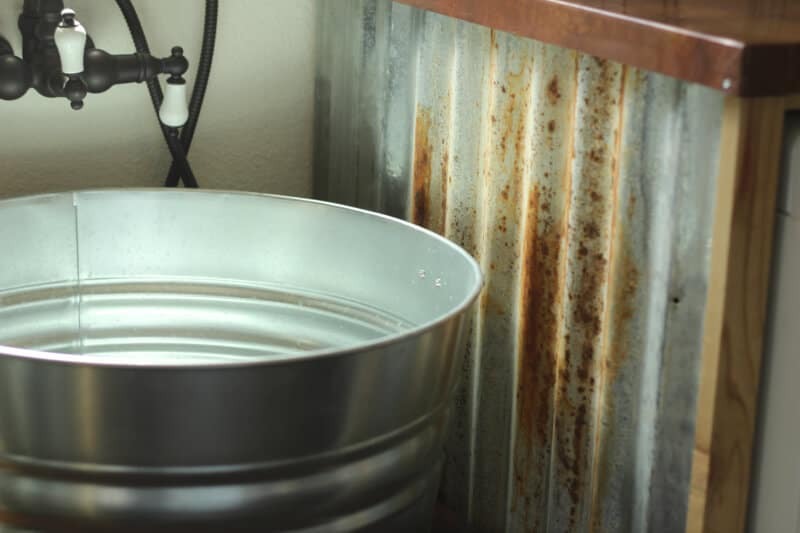 We’ve been in our house for a little over a year now and I LOVE my galvanized mud room sink, but as you mentioned, it doesn’t drain perfectly and has rusted the bottom. Any suggestions on how to combat that short of wiping it out every time…? Who has time for that?! What a great idea!! And I’m with you on knick-knacks. 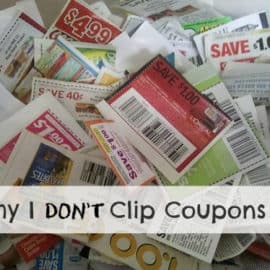 They have to serve a purpose for me they don’t cut it. We are also now empty nesters but not ready to move/downsize, however, we are very much into minimalist thinking so we are getting rid of lots of stuff. Amazing how much you acquire over the years! Yes it is– we’ve only been married for 10 years, and I feel like I am CONSTANTLY purging! Jill, your tastes are impeccable! I enjoy sharing your blog with my daughter, 35, raising our only grandchildren. She and her hubby can’t wait to have a ‘homestead’ of their own in central Oregon, where they already reside in Redmond. 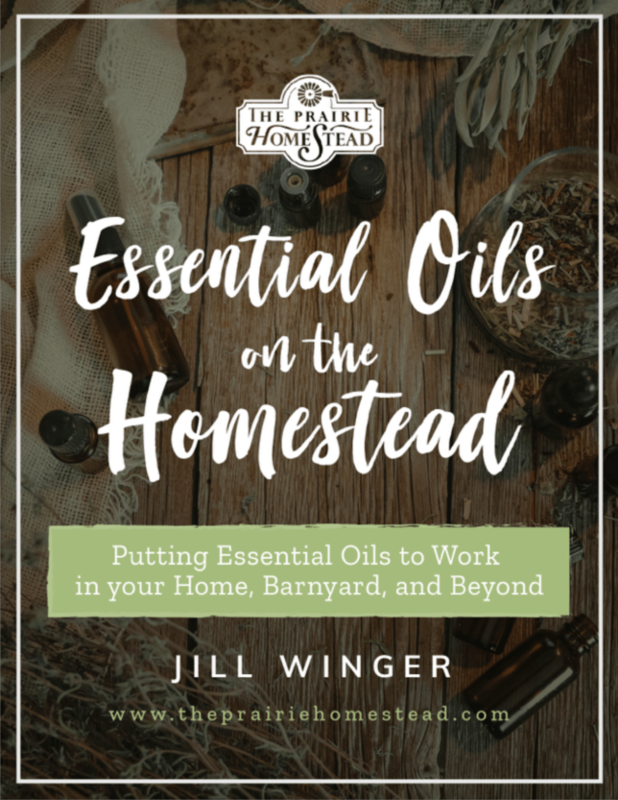 We have our homestead, and encourage our children to get their own! She adores pinterest and I pass on your ideas to her! Your laundry room is gorgeous and practical!! I love every single thing about your laundry room. Love sink and the copper! Great job. I couldn’t help but notice your clothespins and wonder if they are foreign-made. Most are. If you’d like superior, sturdy, American-made, hand-made clothespins made by Herrick Kimball in his shed, go to classicclothespins.blogspot.com, and if you’d like an equally sturdy, beautiful, American-made clothespin bag, go to ladyandthecarpenter.com. His orders are usually backed up several months, they are so in demand. Lady and her carpenter also make the same clothes pins, and might be more quickly shipped. They got their start from Herrick Kimball. Your sink is awesome; I thank you, but my husband may not! I LOVE your laundry room! 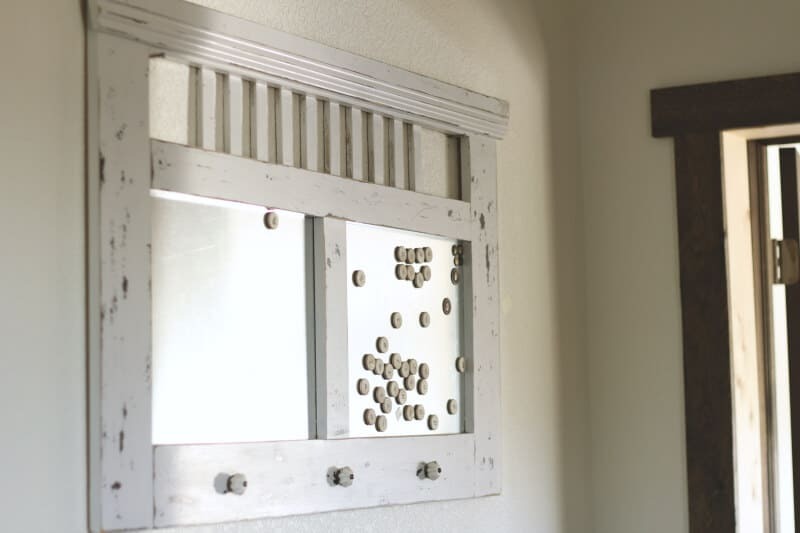 I’m with you on using functional items stored in pretty ways for decor. That’s what I did too when we made our laundry room last year. Wilma is a nice touch though! Wilma definitely needs a garland wreath around her neck! I love your laundry room. I have a question: is the tub a bit low? How would you wash in it without bending way over? It is a little lower than I usually prefer– however– it’s not a huge issue as it’s not my main sink. Where did you get the copper sheet for the counter tops! We are building a Landry room addition and doing the galvanized sink but love the copper too! What steps did you take to get it to where the drain does not leak? I have one but obviously have done something wrong it’s leaking around the drain HELP!!!! Please email me!!!!!!!!!!! I love your pictures and information you shared. I have wanted to do something similar for a bathroom in our new pole barn. Terriffic redo for a rustic lifestyle,functional and fun. The tub sink is especially great. Wish I had space. I hate washing eggs and cleaning veggies from the garden in the kitchen sink. Excellent redo! soooo looking forward to seeing the rest of the remodeling job 🙂 🙂 🙂 it has been so much fun watching your progress !!! I wish you had my cowbell from Germany. My mother-in-law brought it to me when she and my step-father-in-law made a trip to visit his roots (in the 80’s. )When I find time I’ll send a picture. My purple cow collection would have made you an interesting collection. I had to get rid of most of them when I moved. Oh, my wouldn’t my red, white and blue cow look cute on your wall. Even the photo of my dad milking his Missouri cow–with my now 50 year old children looking through the gate (when they were age 2 and 3). That’s inside a very fancy piggy frame my husband gave to me as a present years back. I must not forget the purple cow basket my sister made for me. Why not have a history with your wall? Gelette Burgess and The Purple Cow is a good start. Every generation needs to know that 1895 poem. Life goes better with knowing that poem. Love it! I have a farmhouse and ‘decorated” a functional laundry room. Really like the idea of the countertop space over the dryer. I also have ‘the cow head” – in my bedroom. 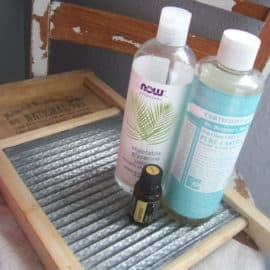 We just moved a large bookshelf from my husband’s office and I now keep my DIY cleaning products (made with EO!) and other ‘pantry type’ items on it. Look forward to seeing the other pictures! LOVE your laundry room! It’s very similar what we’re building. 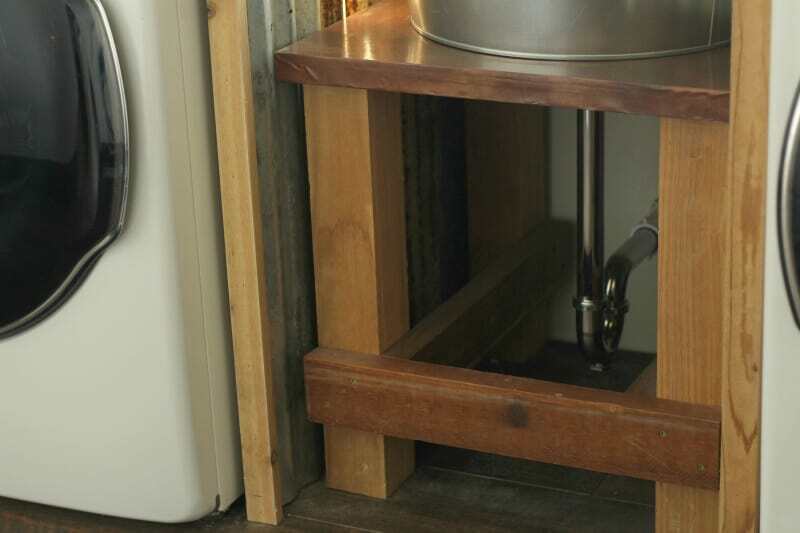 Could you share the dimensions of your sink stand? 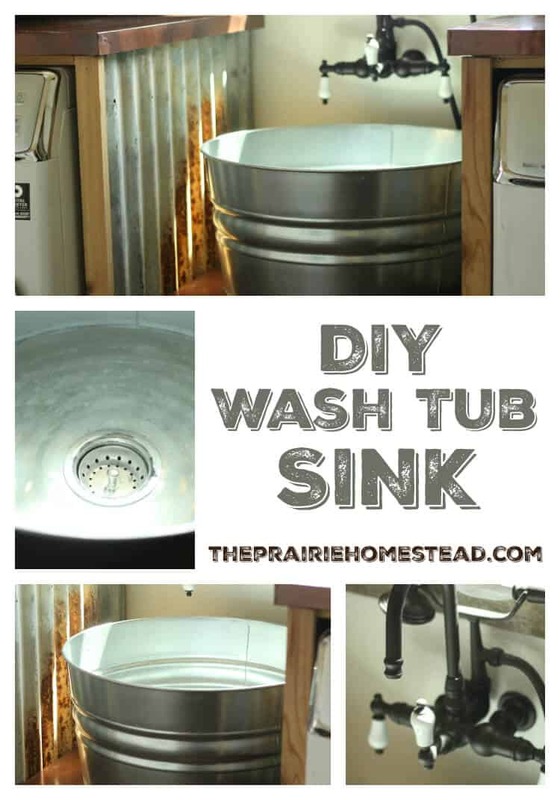 I love your blog but I have a question about the DIY galvanized tub. You had said you had found a company that’s sold waterproof tubs but they were sold out. Do you by chance remember the the website you found the waterproof galvanized tub?